Welcome to Ballet Fantastique! If space is available, you may enroll at any time. Please provide your information below to get to the confirmation screen. NOTE: Payment details are required to register, but if you prefer to pay by cash/check, let us know in the comments box. Enrollment in our more advanced Training/Conservatory Divisions is by Audition/Placement Class only. Please contact us (academy@balletfantastique.org) to schedule your placement so that we can assess your best course fit! If you have questions or problems, please email us at bfan.billing@gmail.com. 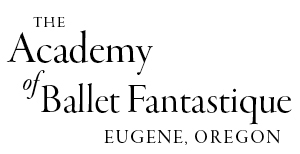 While students are invited to enroll at any time if space is available, The Academy of Ballet Fantastique is proud to offer a year-long training program, with course material carefully created to progress through each term of study. Preparations for performances (and exams for older students) are scheduled into our program as the year progresses. Students achieve their best learning results when they commit to the year of training with their class group. TERMS OF STUDY: Fall: Sept-Dec * Winter: Jan-Mar * Spring: Apr-Jun * Summer: Jul-Aug. The Academy of Ballet Fantastique works to maintain a positive, healthy, productive environment for all students, staff, and dancers. Students are expected to behave in a responsible, respectful, disciplined manner. Gossiping of clients, parents, students, staff, and directors is prohibited. Any harassment, profanity, physical and/or verbal abuse, intimidation, or injury, falsification or misrepresentation of facts, insubordination, disrespect, rudeness, and/or any behavior deemed inappropriate by the directors is grounds to be asked to leave Ballet Fantastique programs or concerts at any time. School Year Classes (Sept-Jun): A nonrefundable annual Registration Fee ($50 for first student in each family; $35 for additional students in the same family) and the first month's tuition installment (pro-rated if registering mid-month) will be collected at this time of registration and thereafter, annually at time of registration. *Each Registration Fee includes a professional Ballet Fantastique uniform leotard for ladies or athletic uniform leotard for gentlemen (value $30). Summer Camps/Workshops (Jul-Aug): NO REGISTRATION FEE. A nonrefundable deposit ($25 for Storybook Dance Camps; $50 for Workshops) is required to hold a dancer's place in class, and will be applied towards tuition balance. Adult/Teen Workshops: NO REGISTRATION FEE. A nonrefundable deposit of $25 is required to hold a dancer's place in class, and will be applied towards tuition balance. Ballet Fantastique's professional teaching staff reserve the right to make initial and ongoing placement adjustments to support each student's individual progression. Like other private and professional dance schools, Ballet Fantastique's year-long training program is broken into terms of study for billing purposes. DEFAULT TUITION PAYMENT OPTION (unless you notify us otherwise): Equal monthly tuition installments toward your full term's tuition balance will be automatically assessed on the 5th of each month. Summer Courses (Jul-Aug): For your convenience, Intensives will be charged in two installments on Jul. 5 and Aug. 5. All other Summer camps, workshops, and class tuition will be billed at time of registration. 1) Term payment (5% discount off monthly installment price); due no later than the 5th of the first month in a new Term. 2) Annual payment (10% discount off monthly installment price); due no later than Sept. 5, annually (may be pro-rated). 3) Cash/check payments: Payment must be RECEIVED to the Ballet Fantastique office (by mail or in the studio tuition box) on or before the 4th of the month--AND please send an email to bfan.billing@gmail.com to alert us to look for your payment. NOTE: Your card will be billed for any balance/remainder due on the 5th of the month. A charge of $25 will be added for any checks returned from the bank. * If the tuition due date will be a hardship for your family, please make arrangements as soon as possible by emailing bfan.billing@gmail.com; we will do our best to work with you to set up an installment plan. Otherwise, a $10 late fee will apply for each 30 days an account is overdue. * Ballet Fantastique is not able to issue refunds for any missed class, for holidays or studio closure days, or for withdrawal that does not follow the below Withdrawal Policy. * Tuition is non-refundable. Refunds will not be made, except in the case of serious illness or injury, verified by a doctor's letter. If a student is dismissed from the Academy because of unacceptable behavior, no tuition will be refunded. Ballet Fantastique has the right to deny any refund request. Except in the case of a class cancellation by Ballet Fantastique, Ballet Fantastique does not issue cash refunds, only credits to studio account, minus appropriate processing fees. All camps/classes are subject to change. Ballet Fantastique reserves the right to cancel any class or camp based on enrollment. If a class or camp is cancelled by Ballet Fantastique, families will be refunded in full. Summer camps, classes, and workshop fees: Student cancellations 30 days or more from camp/class/workshop start date will receive a full refund (in the form of Ballet Fantastique credit; see Refunds policy), less the nonrefundable deposit. Cancellations 14-30 days from camp/class/workshop start date will receive a 50% refund (in the form of Ballet Fantastique credit; see Refunds policy), less the nonrefundable deposit. Cancellations less than two weeks prior to the camp/class/workshop start date will receive no refunds. PUBLICITY RELEASE NOTE: Students of The Academy of Ballet Fantastique automatically grant permission to usages of their photos and videos for advertising and publicity purposes, including print advertising, educational videos, social media, television, video taping, or film broadcast in connection with promotional campaigns.